The figure below shows the user interface of ProM 6. This section explains the basic features of this user interface by explaining the different objects in this interface. To do so, the figures in this section (and the next two sections) assigns a character (from A to Z) to every object, and explain the use of every object. For example, the figure assigns A, B, and C to the main tabs, which allow you to choose from the different views, as is explained below. 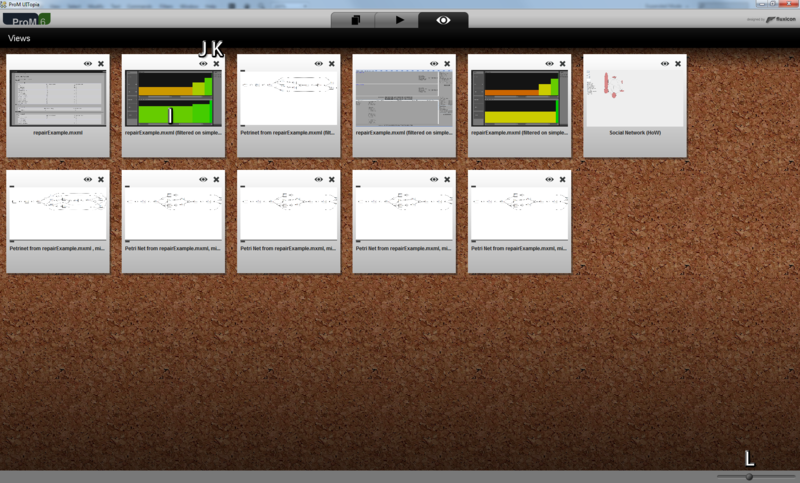 The “Workspace” tab brings you to the workspace view. The “Action” tab brings you to the action view. The “View” tab brings you to the view view. are a result of executing an action on some other resources. From these resources, at most one can be selected, for which additional details can be shown. The figure below shows the workspace view. The “import. . . ” button imports a resource from a file into ProM 6x. The “All” tab shows all resources in the resource pool (G). The “Favorites” tab shows the favorite resources in the resource pool (G). The “Imported” tab shows the imported resources in the resource pool (G). The “Selection” tab allows you to view a selection of resources (see (P) and (Q)) in the resource pool (G). The sorting buttons sort the resources in the resource pool (G). The leftmost button allows you to sort them on the time they were created, the middle button on the time they were last used (as import of some action), and the rightmost button on the name. The resource pool shows the appropriate (through tabs (B) to (E)) resources in the appropriate order (see (F)). A selected resource. 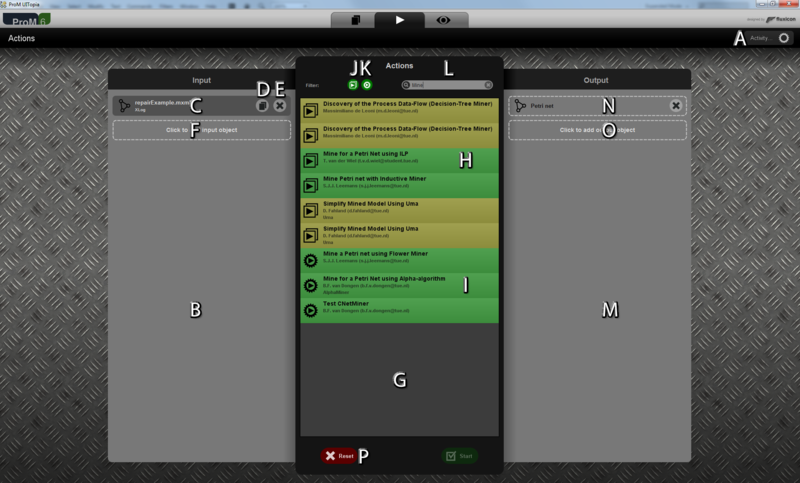 The resource view pane (J) shows details on this resource. The resource view pane. 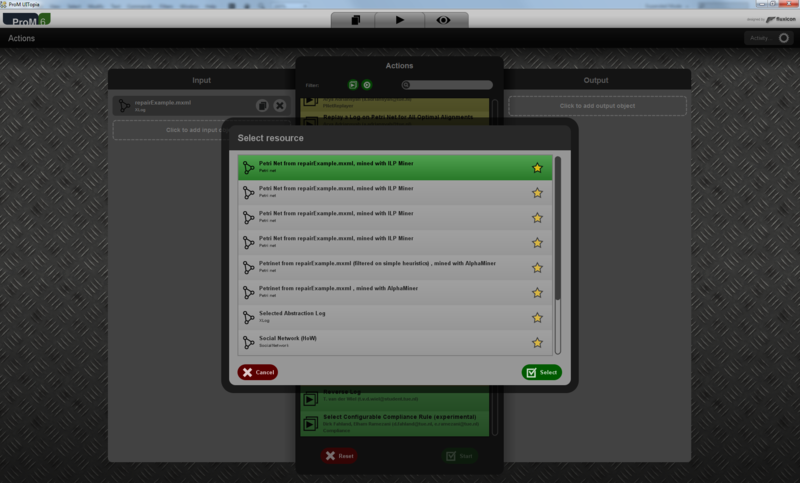 Shows details on the selected resource (if any). A preview of the selected resource, if available, with additional details such as name, type, and where it came from. The “Favorite” button toggles whether the selected resource is a favorite. The “View” button brings you to the view view for the the selected resource, which is explained in Section 3.3. The “Action” button brings you to the action view with the selected resource added as an input for the action. The action view is explained in the next section. The “Remove” button removes the selected resource. The “Show parents” button brings you to the “Selection” tab (E) showing the parent resources of the selected resource, that is, the resources that were used to create the selected resource. The “Show children” button brings you to the “Selection” tab (E) showing the child resources of the selected resource, that is, the resources for which the selected resource is a parent. The “Export to disk” button exports a resource from ProM 6 into a file. This section explains the action view. Basically, this view shows all actions that can take certain resources as inputs, result in certain types as outputs, and that match certain filter criteria. Using the action view, it is straightforward to select appropriate actions for your resources. Even better: given your current resources, and given a resource type you would like to have, the action view can show you the actions which could generate a resource of the desired type from the current resources. 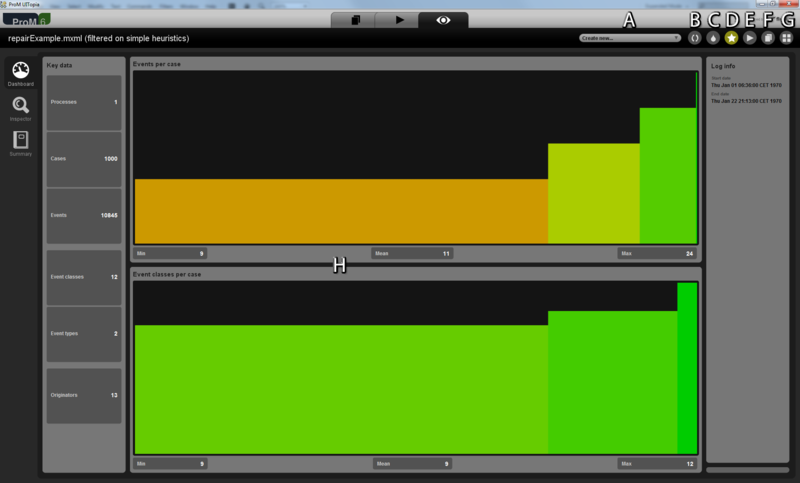 The figures below show the action view, where the top figure shows a situation where no action has been selected yet (hence the required inputs and generated outputs are not yet known), and the bottom figure shows a situation where an action has been selected. The “Activity. . . ” button opens activity view, which is shown in the figure below. This view shows which actions have been executed and which actions are still running. For example, in this figure, the “Mine for a Petri Net using ILP” action is still running ans has been executed at least three times earlier. Selecting the “X” button for a running action cancels that action. 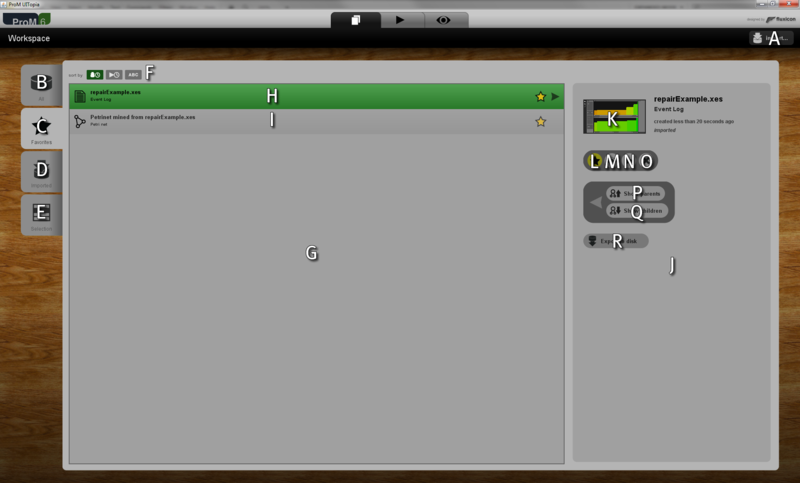 The input pane shows the input resource pool. If an action is started, then these resource will be used as inputs for the action. The resource element shows that the corresponding resource (in this case the Petri net that resulted from running the ILP Miner on the event log “repairExample.mxml”) is in the current input resource pool. 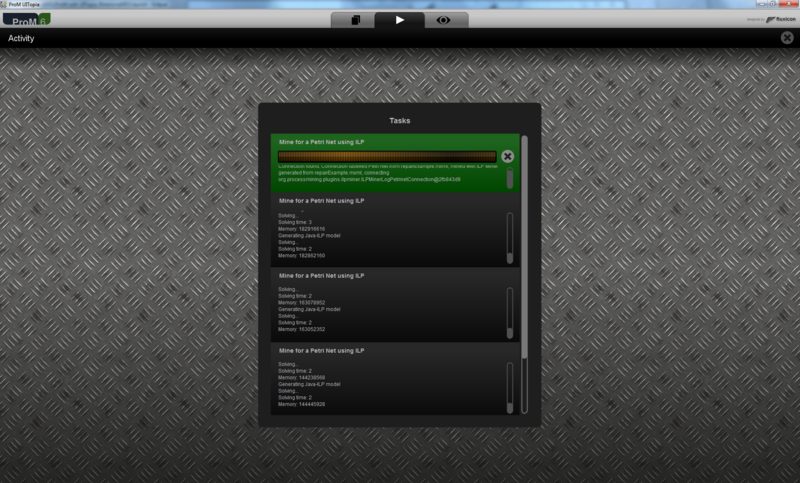 The “Workspace” button brings you to the Workspace view with the corresponding resource selected. The “Remove” button removes the corresponding resource from the input resource pool. Note that this will not remove the resource itself, it only removes the resource from this pool. The resource placeholder allows you to add a resource to the input resource pool. The figure below shows the details. Note that this placeholder is only available if no action has been selected in the action pool (G). The action pane shows the action pool, which lists possible actions based on both the input resource pool (B), the output type pool (M), and the action filter (L). This “Action” element shows (note the symbol on the left-hand side) that the corresponding action (“Mine for a Petri Net using ILP”) is interactive, that is, it may require to be configured by the user. This “Action” element shows (note the symbol on the left-hand side) that the corresponding action (“Mine for a Petri Net using Alpha-algorithm”) is batch, that is, it does not require to be configured by the user. The “Interactive” button toggles the interactive filter, which filters on the interactive actions. The “Batch” button toggles the batch filter, which filters on the batch actions. The “Search” field allows you to filter on action name. The output pane shows the output type pool. If an action completes, then resources of these types will be generated. The type element shows that a resource of the corresponding type (in this case a Petri net) is in the current output type pool. The type placeholder allows you to add a type to the output type pool. The figure below shows the details. Note that this placeholder is only available if no action has been selected in the action pool (G). The “Reset” button resets the action view: it clears the input resource pool, the output type pool, and the filter, and it deselects all actions in the action pool. 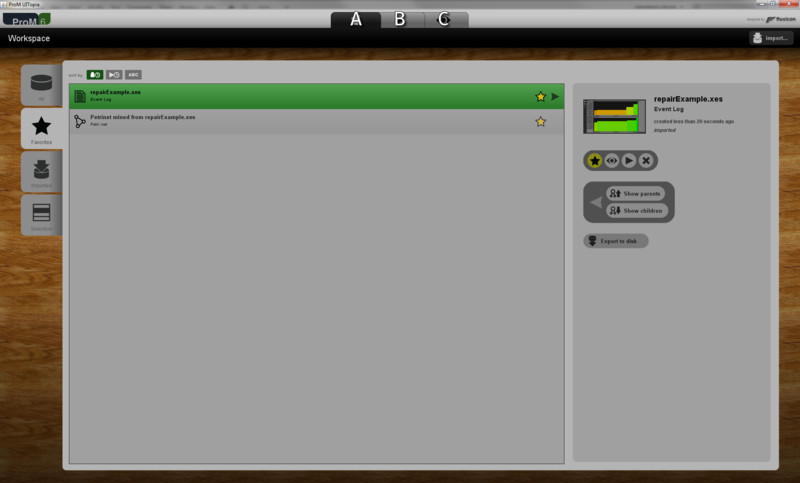 The “Start” button starts the selected action on the selected input resources. An action that requires additional input resources. For easy recognition, such an action is colored yellow. An action that does not require additional input resources, that is, this action can be started on the current set of input resources. For easy recognition, such an action is colored green. The selected action. In this case, this action does not require additional resources, but it is also possible to select an action that requires additional resources. In that case, placeholders for these additional resources are added to the input resource pool, and the user can select the appropriate resources for these placeholders. The output type pool shows the types of the resources that will be generated if the selected action is performed. In this case, it shows that the “Mine for a Petri Net using Alpha-algorithm” action will generate a Petri net and a marking. This section explains the view view. Basically, the view view shows one resource, or an overview of all resources for which a view exists. The figures below show the view view, where the top part shows the view on one resource, and the bottom part shows the overview. The view dropdown list allows you to select alternative views (on the same resource). The “Refresh” button refreshes the current view. The “Print” button prints the current view. The “Favorite” button toggles whether the corresponding resource is favorite. The “Action” button brings you to the action view with the corresponding resource added as an input for the action. The “Overview” button brings you to the overview view (see figure below). The main area shows the view on the corresponding resource. A slide shows a preview on the corresponding resource. The “View” button opens the view view for the corresponding resource. The “Remove” buttons removes the view for the corresponding object. Note that this will not remove the resource itself, it only removes this view on the resource. The slider in the lower-right corner controls the size of the slides.